Camberis, M., Bouchery, T. and Gros, G. L. (2016). Isolation of Nippostrongylus brasiliensis Larvae from Mouse Lungs. Bio-protocol 6(4): e1736. DOI: 10.21769/BioProtoc.1736. Isolation by thermal induced migration-allows for the recovery of viable larvae but not dead or moribund larvae. Isolation by digestion of the lung-allows for the recovery of both dead and viable larvae. Isolation by bronchoalveolar lavage (BAL) -allows for the assessment of the number of molt 4 larvae on their way to the gut. These protocols can be used to follow the dynamics of worm migration during infection and the effect of the host immune system on worm viability and fecundity. Prepare the Migration tube by adding 45 ml PBS to a 50 ml tube. Keep warm in 37 °C water bath until ready to use. 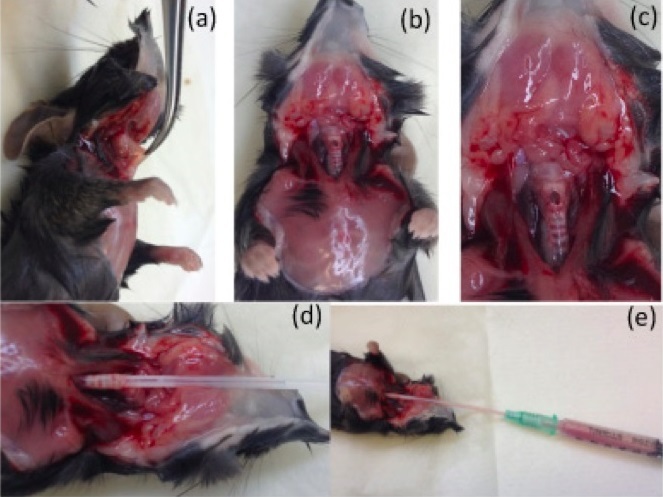 Euthanize the infected mouse by cervical dislocation or any approved form of euthanasia. Place mouse on its back and wet with 70% ethanol. Expose the thoracic cavity; remove the lungs and place in a clean disposable weigh-boat. Dice the lungs into fine tissue pieces of approximately 1-2 mm using the scissors. Place an 8 x 8 cm piece of cheesecloth into a prepared 50 ml tube with the edges of the cloth hanging over the side of the vessel; this should form an open pouch in the tube (Figure 2a). Transfer the diced lung into the pouch of the prepared 50 ml tube (Figure 2b). Take the exposed edges of the cheesecloth, and close the pouch in such a way that the exposed cheesecloth edge hangs over the edge of the 50 ml tube (Figure 2c). Seal the tube with the cap so as to trap the edge of the cloth under the cap (Figure 2d). Place in water bath and incubate for at least 3 h at 37 °C or up to overnight in water bath. Note: Ensure at least two-thirds of the tube is submerged in the water as the larvae migrate out of the tissue by following a thermal gradient and settle at the bottom of the tube. Discard cheesecloth following incubation period. Note: Worms will have migrated through the tissue and collected at the bottom of the 50 ml tube. Without disrupting the pellet, discard all but 2 to 3 ml of the PBS by aspirating with a plastic disposable pipette. Transfer the contents of the tube into a 60 x 15 mm TC dish and visualize the larvae using a stereo microscope. Note: Volumes of more than 3 ml can make focusing on the larvae difficult. Euthanize the mouse by cervical dislocation or any approved form of euthanasia. Expose the thoracic cavity; remove lungs and place into a well of the 6-well dish. 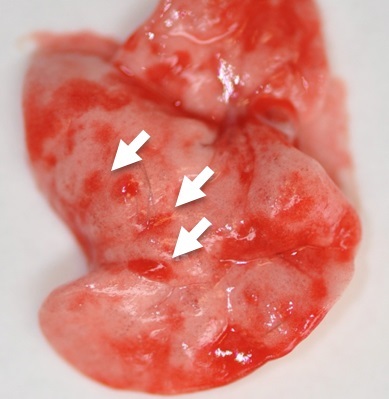 Dice the lungs into fine tissue of approximately 1-2 mm pieces using the scissors. Add 5 ml Digestion mix to each well and gently mix by swirling the plate. Incubate for 45 min at 37 °C with slow agitation in a shaking incubator. Transfer the contents of the tube to a 40 μm cell strainer attached to another 50 ml tube, using a disposable pipette. Note: This separates the lung tissue from the larvae, the larvae staying trapped in on top of the filter. Transfer the 40 μm strainer to a 6 well TC dish and place the 40 μm strainer upside down. Rinse with 5 ml IMDM using a disposable pipette to dislodge larvae trapped on the cell strainer. Inspect the cell strainer for the presence of larvae using a stereo-microscope and rinse again if necessary. Visualize larvae using a stereo-microscope. This protocol has been adapted from protocols used in measuring allergic airway inflammation (Harris et al., 1997; Erb et al., 1998). Euthanize the mouse by cervical dislocation (or any approved form of euthanasia) but taking care to maintain the integrity of the trachea. Make a midline incision, pull back the skin and expose the trachea by carefully separating the muscle tissue above the trachea (Figure 3a). Make a small horizontal incision across the exposed trachea without going right through the trachea (Figure 3b and Figure 3c). Attach an 18 G Insyte catheter to a 1 ml syringe and fill with 1 ml PBS. Insert the catheter approximately 10 mm into the trachea and flush the contents of the syringe into the lungs (Figure 3d). Draw the fluid out (Figure 3e) and place contents of syringe into a 15 ml tube. The lavage fluid will be contaminated with blood due to the damage caused by the larvae entering the lung. To improve visualization of the larvae when lavage fluid is contaminated with blood, spin the BAL fluid down at 1,400 rpm for 2 min, remove the supernatant and lyse the red blood cells by the addition of 3ml of water to the pellet, then count larvae. Distinguishing features of the molt 4 larvae is the deposition of a dark-brown pigment that is clearly visible in the gut (Bouchery et al., 2015). Repeat twice more with fresh PBS for each lavage. Visualize the larvae by transferring the lavage into a 60 x 15 mm TC dish and inspecting the contents using a stereo microscope. For consistent results using the above protocols, it is important to always use larvae from 2-6 weeks old cultures for infecting mice. The infectivity of larvae is much reduced after 6 weeks culture (Camberis et al., 2003; Kassai, 1982). This work has been adapted and modified from previous work carried out by Professor Graham Le Gros’s Allergy and Parasitic diseases laboratory, Malaghan Institute of Medical Research, New Zealand. This work was supported by The Health Research Council of New Zealand and the Marjorie Barclay Trust. Erb, K. J., Holloway, J. W., Sobeck, A., Moll, H. and Le Gros, G. (1998). 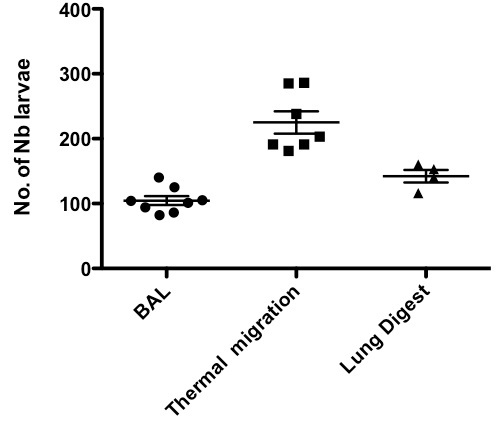 Infection of mice with Mycobacterium bovis-Bacillus Calmette-Guerin (BCG) suppresses allergen-induced airway eosinophilia. J Exp Med 187(4): 561-569. Harris, N., Campbell, C., Le Gros, G. and Ronchese, F. (1997). Blockade of CD28/B7 co-stimulation by mCTLA4-Hgamma1 inhibits antigen-induced lung eosinophilia but not Th2 cell development or recruitment in the lung. Eur J Immunol 27(1): 155-161. How to cite: Camberis, M., Bouchery, T. and Gros, G. L. (2016). Isolation of Nippostrongylus brasiliensis Larvae from Mouse Lungs. Bio-protocol 6(4): e1736. DOI: 10.21769/BioProtoc.1736.